During our worship services, music is presented as an offering to God, not just by our choirs and soloists, but by the entire congregation. 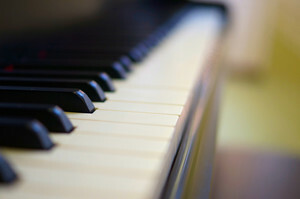 As a family of faith, we lift our voices to God in song through a wide range of musical selections from the strong classic hymns of our faith played by piano all the way to singing the latest contemporary Christian song via video technology. Our music ministry offers something for everyone. If you are passionate about music, or just want to try out something new, you are invited to join us in serving God through music. We have many opportunities such an adult choir, which often leads the congregation in worship on Sunday morning. 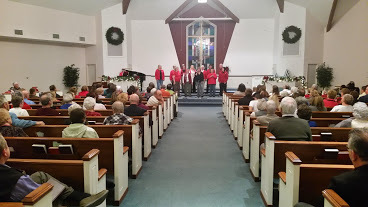 We also offer musical opportunities for all age groups. .
Every first Sunday in December, FBC hosts the Coffee Creek Association "Carols and Choirs" event. 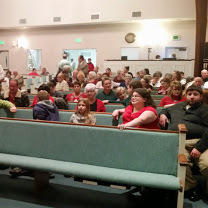 Many churches gather to sing, celebrate, and collect funds for the Edna Martin Christian Center. 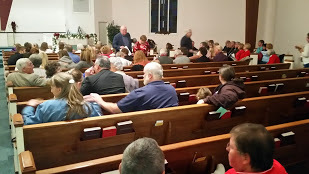 Above are some photos from past Carols & Choirs.